Colin and Marjorie discover a hedge of Hylocereus with the World’s biggest cactus flowers. We have just returned from a wonderful short break on Tenerife where, needless to say, plants featured prominently. A major theme has been SIZE and we’re talking BIG here! Top of our list of plants to see was the LARGEST dragon tree (Dracaena drago) in the Canary Islands, at Icod de los Vinos. Next, the Jardin de Aclimatacion in Puerto de la Cruz, just around the corner from where we were staying at the fabulous Hotel Botanico, is home to the BIGGEST specimen we have seen of the strangling fig (Ficus macrophylla), with its numerous buttress roots, which dominated the centre of the botanic garden. Most impressive of all, though, was that we found and photographed a cactus with the BIGGEST flowers we’ve ever seen, justly deserving a write-up for NN! The cactus formed a hedge (Fig 1) at the front of a small house roughly a 15 minute downhill walk into the town centre from our hotel. 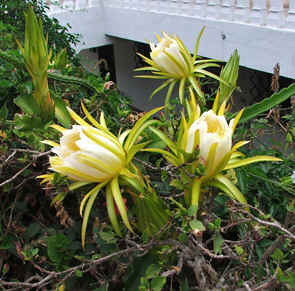 From its 3-angled stems we knew immediately that we were dealing with a species of Hylocereus. This name, incidentally, comes from the Greek and means ‘forest Cereus’. On our first encounter, late in the morning, we saw mainly buds (Fig 2), but it was clear that these would open fairly soon, so these were carefully monitored because we knew that we were observing a night-flowering plant. Sure enough, two days later it became apparent that buds were going to open that night. After dinner, being the dedicated plant hunters that you know us to be, at around 10.00 pm we took a stroll back down the hill where we were rewarded by seeing some open flowers (Fig 3). 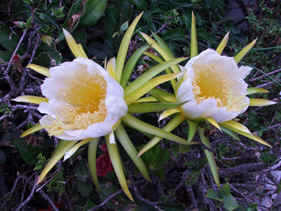 Each flower bears a tube without spines, wool or hairs, distinguishing it from those of the other famous night-blooming cactus, Selenicereus, which has spiny flower tubes. So, “our” plant is undoubtedly a species of Hylocereus. The flower is about 30 cm long and maybe slightly over 30 cm across, making this THE BIGGEST cactus flower we have ever seen! These flowers are truly stunning, but interestingly we could not detect even a trace of scent. Fig 1 (Top): A hedge of Hylocereus at Puerto de la Cruz, Tenerife. 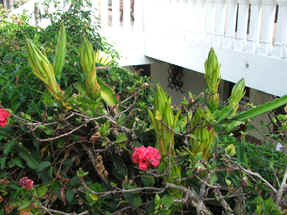 Fig 2 (Middle): Buds of Hylocereus. 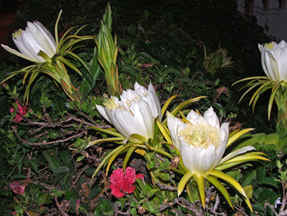 Fig 3 (Bottom): Flowers of Hylocereus open at 10.00 pm two days later, taken by flash. The next morning, Colin being the absolutely dedicated plantsman that he is, returned to the site at 8.00 am even before breakfast, whilst Marjorie watched some of the Japanese Grand Prix - well, a girl can only take so much plant work on holiday! The flowers were still open (Fig 4). Later in the morning at around 11.00 pm the flowers were starting to fade (Fig 5). So, these HUGE cactus flowers are truly nocturnal, and each lasts fleetingly for a single night. Britton & Rose (1909) described the genus Hylocereus as follows: “Climbing cacti, with elongated, 3-angled or 3-winged stems and branches emitting aerial roots, their areoles bearing several short spines and a tuft of very short wool; flowers very large, nocturnal, funneliform…..” This absolutely matches our plant. Bauer (2003) produced the most recent review of Hylocereus and its relatives. He recognised 15 species with a tropical distribution from southern Mexico south to northern Argentina. Using his key our plant is Hylocereus undatus, where the specific name means ‘wavy’ for the margins of the ribs. The origin of the plant used by the famous English botanist Adrian Haworth to describe the species as Cereus undatus in 1830 was apparently China! Bauer (2003) says that “it could be that this species originated in southern Mexico or Yucatan. However, today it can be found all over the New World tropics. It is much cultivated and has undoubtedly very often escaped from cultivation. Now it is also widespread in southeast Asia”. So, having seen H. undatus in cultivation before, our encounter on Tenerife was the first time that we had observed fully opened flowers, and truly spectacular these are: THE BIGGEST cactus flowers of all. The fruits, which we have not yet seen, are equally large, being described as ovoid to globose, up to 12 cm in diameter, and orange-yellow to bright red (Taylor & Zappi, 2004). 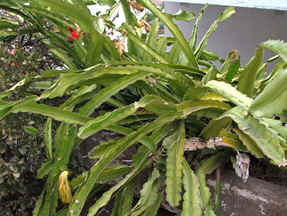 Anderson (2001) says that this species “has become a popular cultivated plant in Vietnam, the fruits being called dragon fruits. Large quantities are exported to other Asian countries”. We’ve yet to sample the delights of these dragons, but will now hunt these down and give them a whirl. Fig 4 (Top): Flowers still open at 8.00 am the following morning. Fig 5 (Bottom): Flowers starting to fade at 11.00 am the same morning. Anderson, E.F. (2001) The Cactus Family. Timber Press, Portland, Oregon. Bauer, R. (2003) A synopsis of the tribe Hylocereeae Buxb. Cact. Syst. Init., 17: 1-64. Britton, N.L. & Rose, J.N. (1909) The genus Cereus and its allies in North America. Contr. U.S. Natl. Herb., 12: 413-437, pls. 61-76. Taylor, N. & Zappi, D. (2004) Cacti of Eastern Brazil. The Royal Botanic Gardens, Kew.